Panopto is a great tool that we have available at Aalto University for making lecture capture. 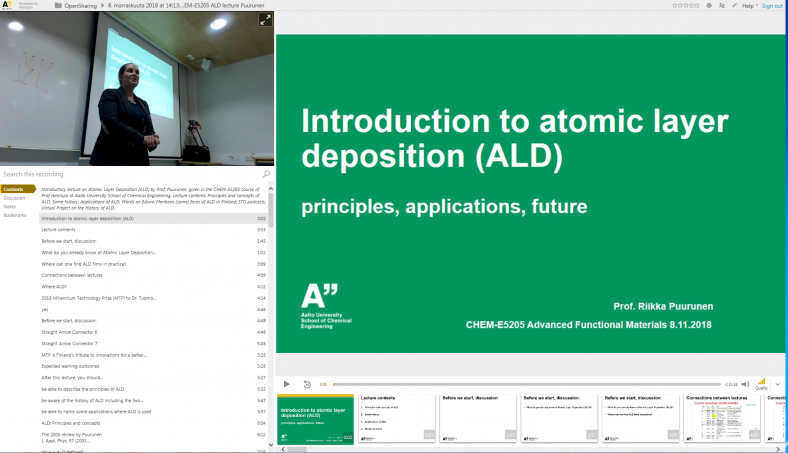 Yesterday, I gave my first introductory lecture on atomic layer deposition (ALD) in general as a professor at Aalto University. I recorded the lecture with my own laptop, using one of the Panopto sets available since half a year or so at the School of Chemical Engineering. The lecture capture worked out fine and the lecture can now be watched in Panopto: https://aalto.cloud.panopto.eu/Panopto/Pages/Viewer.aspx?id=bd0aee67-7ca5-4973-8216-a99200e888b1, as well as Youtube: https://youtu.be/i-m52yTdZB0. The slides are available to view separately in SlideShare: https://pt.slideshare.net/RiikkaPuurunen/introduction-to-atomic-layer-deposition-ald-principles-applications-future. A discussion thread was started in LinkedIn ALD – Atomic layer Deposition group (https://www.linkedin.com/feed/update/urn:li:activity:6466591287486214144). Sharing teaching openly like this – in an OpenTeaching manner – is the first trial for me. Let us see what follows from it! on 13.11.2018: Youtube link added. This entry was posted in teaching and tagged atomic layer deposition, atomic layer epitaxy, millennium technology prize, molecular layering, open teaching, openteaching, Suntola, virtual project on the history of ald. Bookmark the permalink. It’s a great initiative Prof. Puurunen. Please keep this going. I would suggest you to please have a word with Coursera coordinators and prepare an online certification course on ALD. I know it’s little difficult with your packed schedule. However, it would be an amazing favor for the coming ALD community. Thank you for this comment! I agree with you and have been thinking of this. It is a long way to realize it. A first step has been to start discussing the fundamentals – here: https://twitter.com/rlpuu/status/1061968020493529088.